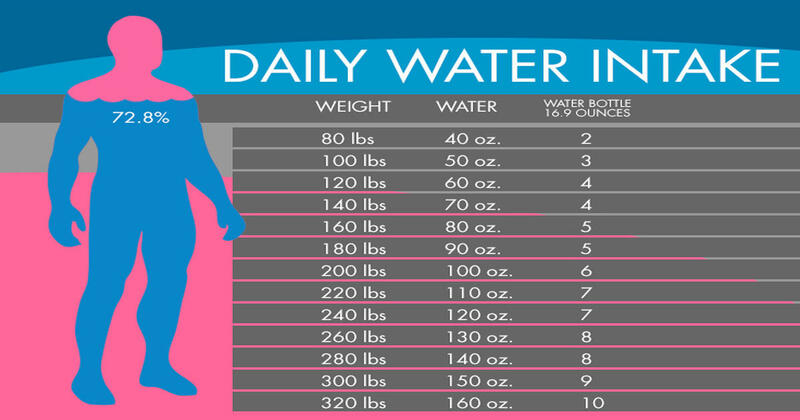 The human body can last about 3 weeks without food, but cannot go more than 3 days without water. The body is made up of approximately 60% water. According to H.H. Mitchell, Journal of Biological Chemistry 158, the brain and heart are composed of 73% water, and the lungs are about 83% water. The skin contains 64% water, muscles and kidneys are 79%, and even the bones are watery: 31%. Furthermore, water forms the basis of blood, digestive juices, urine and perspiration and is contained in lean muscle, fat and bones. Since the body can’t store water, we need fresh supplies every day to make up for losses through the lungs, skin, urine and feces. Water is needed to maintain the health and integrity of every cell in the body, to keep the bloodstream fluid enough to flow through the blood vessels, to help eliminate the byproducts of the body’s metabolism, to help flush out toxins, to regulate body temperature through sweating, to lubricate and cushion joints and to carry nutrients and oxygen to the body’s cells, just to name a few. 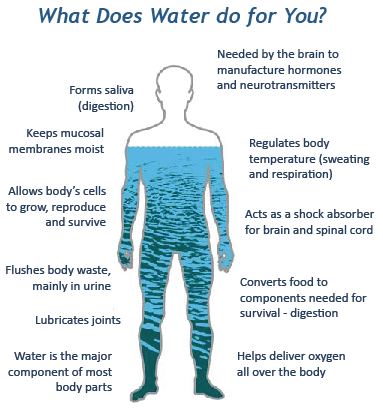 Water is certainly the fuel that keeps the body’s engines running! Drinking refreshing, clean water plays a major role in reducing the risk of certain diseases. Water lubricates and pads arthritic joints and reduces the friction that causes arthritis pain. Water helps to remove uric acid and other toxins from joints that build-up causing swelling and pain associated with gout. It appears as though there is a strong relationship between water and coronary health; one study demonstrated that drinking 5 or more glasses of water per day can cut the risk of dying from a heart attack by 50%. Water can help with constipation. It is important to consume a diet that contains healthy fats, fibers, vitamins and minerals, but it is equally important to consume adequate amounts of water. When you are hydrated, less water is taken from the colon – leaving stools softer and easier to pass. And, this is by no means an exhaustive list. To put a twist on Newton’s theory of gravity, what goes in must come out. The body loses water naturally in many ways: through the skin by perspiration, kidneys by urine, lungs by breathing out water vapor, and the intestines through bowel movements. Medicines, diet, exercise, stress, and environmental temperatures can also affect the body’s water loss. The loss of body water through urination is greatly increased by the ingestion of decaffeinated and alcoholic beverages. These drinks have a diuretic effect, meaning they stimulate the kidneys to excrete more urine. Not only do we lose water, we also lose water-soluble vitamins, such as vitamin C, vitamin B (thiamine) and other B complex vitamins. For every caffeinated or alcoholic beverage you drink, you need to add an additional glass of pure water to maintain optimal bodily functions. Getting enough water is easy enough. Consider filling a pitcher with your daily recommended amount of water, and drink a glass when you wake up, at breakfast, lunch, dinner, and bedtime. That’s 5 glasses right there. I’ll leave it up to you to squeeze the last 3 glasses into the day.